Yep, I cannot imagine not owning the E72 as it launched in Singapore on 14 Nov, but I had to wait until this Monday before I could get my hands on the Black edition from my nearest StarHub Shop (I could travel to another location but I could wait). I have come across numerous positive reviews about this phone, and while people do qualify that the phone is not a revolutionary difference from E71, my first-hand first-time experience is far from what they have summarised. Here are some personal feedback about the E72, with direct comparison with the E71. 1. The black plastic at the back of the phone is matt. The E71 is a glossier plastic surface that feels more durable and more susceptible to usage marks. 2. The optical navi-pad needs getting used to in the first few hours of usage. The trick is to lightly glaze on the pad instead of rubbing it like an aladdin lamp. The challenge is to know how to control the speed of the slide. I don’t think anyone can master it, as it really depends on the mood of the E72. I mean, for some apps, a swipe can scroll many lines. For some, a super swipe can only move one line a time. Fortunately, the D-pad can be used at the same time. And I wonder if this optical navi-key is durable enough to be abused with all the rigorous swipings and rubbings. 3. Nokia Messaging’s menu transitions (edited 30/11/2009). In general, menu transitions can be turned off which will speed up the navigation. But this disabling option is not available for the Nokia Messaging emails. It’s a small pain if you like to access the emails as promptly as your text messages. 4. Multi-press implementation on the keypad. On the E71, say when I press any key, I need not release the key before I press another letter, and the E71 registers the key. For E72, if I do not release a key, the next key-press within the number keypad range (1-0, * and #) cannot be registered (any other characters outside the keypad range is ok). As a result, I will tend to miss out a few characters during usage. I reckon there are some multi-press controls pertaining to the number keypads, but there wasn’t such a problem on the E71, so I wonder why. 5. Key layout changes. In the E71, the softkeys and the answer/hangup keys protrude and the 4 shortcut buttons are recessed. In the E72, it’s the reverse. The 4 shortcut buttons are slightly raised while the other 4 surrounding buttons are relatively lowered. As a result, I often find myself pressing the “Home” or “Message” keys more often. 6. Battery life. It’s no different from my E71. Even if there is, the difference is negligible as I would have to charge the phone daily just in case. 7. Memory. After start-up, my RAM remains about 28MB. It’s worse than E71 where it’s a health 60MB. Phone auto-restart already happens a few times over the past 3 days. 8. Interface speed. While the transition effects slow some screens, the E72 zips by on the other standard screens. One noticeable speed bump that I frequently use is the Inbox message. It scrolls to the next message instantly. 9. Nokia Messaging. It’s better integrated into the Messaging menu. It also has more sync schedule options. 10. E71 apps. All the existing E71 apps continues to work, even themes. But I’m not sure if there are any underlying issues, for instance, memory management. But for now, Handy Shell and Gravity are the only 2 third-party apps that I am running on the background most often. 11. Camera (add 30/11/2009). The camera app opens just as slow, and the focus is even slower than E71. 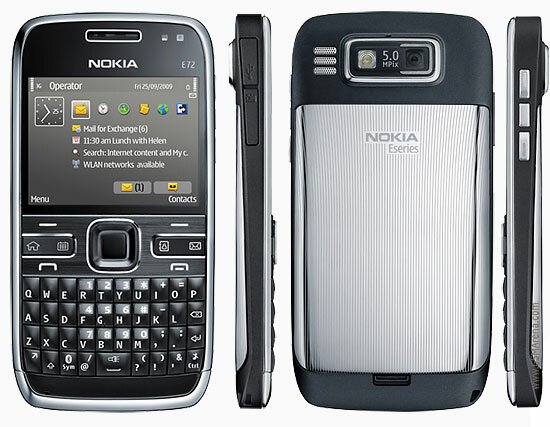 On the whole, the Nokia E72’s major difference in the usage experience is the optical navi-pad. I got so used to the optical pad that I habitually tried to swipe when using the E71 (now proudly owned by my wifey). I prefer the handling of the E71 which feels more streamlined. And though statistics show that E72 is heavier by 1g, I actually thought the E71 felt heavier (perhaps with additional weight from the accumulated dirt). Personally, I would not have bought the E72 if not for the attractive launch price coupled with the need to trade-in my old Sony Ericsson G900. Any later and the G900 would be worth nothing. On top of that, I signed up for the MaxMobile Premium at $9.95 for 24 months that takes another $100 off the phone price. So the final price tag for my E72: $118, recontracted on my wifey’s PowerPlay II. I’m very glad my wifey can now enjoy the benefits of the E71, especially in the ease of online connectivity. She is now able to Facebook more frequently and do Google searches with ease, certainly a better experience that her previous Samsung Pixon, no doubt a great phone and camera but fails terribly in online connectivity. Could you look in the theme options for disabling menu transition and icon animation. This is the only reason for me to delay buying the phone. After much use, I realised that I the menu transitions can be turned off. There is a option to disable theme effects. However, the transition cannot be disabled for Nokia Messaging emails. Here is my take. I have had the E72 for a month now and I am frustrated like hell. 1.Camera takes 4-5 seconds to open and after you click a picture, the 'processing' message remains for as much as 6 seconds on the screen. On my E71 it took less than a second. 2.While checking with Phonetinfo, and Phoneinfo, the processor speed is shown as 192 Mhz, though some claim that a newer version of Phonetinfo will show 600 Mhz. 3. The Email software from NOKIA is regressive. The IMAP folders are not as easy to reach as in E71 and they do not display the number of unread messages in brackets, meaning you have to open all folders to be able to know if there are any unread messages. 4. There is a lot of animation / transition time in the email program. I would ask NOKIA to do away with the transitions and make it snappy. I like snappy. 5. The back cover on E71 was solid but on E72 it keeps coming loose. There is only one button which is easy to press even while lying on the table. Many a times I have lifted my phone from the table and the back cover is falling off. 6. The menu has been redesigned to make you go seceral levels. On E71 it was menu>setting> whereas on E72 it is menu>control panel> settings making you click more buttons. In order to go to maps you need to go to menu>app>gps rather than menu>gps on E71. I know one can rearrange the icons but this is regressive development from Nokia. 7. The sunc cable is like 6 inches long. On the E71 I could lift the phone from the table and answer a call while it was connected to my laptop, but in E72, I have to disconnect the cable or bend awkwardly to take a call. Why a 6 inch cable, down from a meter long cable on E71. 8. On the E71 camera, you could go to options>gallery, but on the E72, the gallery option is missing making you scroll through the main menu to go to the gappery. 9. During a call, the optical key stops functioning. If you are scrolling through a number or the menu while on a call, the optical key will not work. It also does not work in the Camera menu tool bar once the picture is taken. It works before the picture is taken. 10. I have not had once incident when the voice recognition could make out who I was trying to call. It always gets the wrong name. 11. The plastic covers for the Micro USB and the MicroSD card fall off. They have to be very carefully pulled out or else you can lose them. 12. Another issue is that unlike E71 messaging, there is no option to sync the 'read' message status. It automatically does. Meaning, if I have read a message on the phone, it will show as read on my Gmail. 13. There is no option to turn on HTML messages universally. One has to do it for every mail individually.